Do you want a Tendonitis Treatment that actually WORKS?? There are a good many different methods of dealing with Tendonitis. Most of them just deal with the symptoms of Tendonitis, as opposed to dealing with the SOURCE, the CAUSE of the pain and limitation. If you have Tendonitis, I suggest that you deal with the CAUSE of your pain and actually reverse the Tendonitis Dynamic. Otherwise, it’s predictable that your pain will return, and worse than it was before. While Tendonitis has a particular dynamic that it follows, everybody is a little different. So you will hear of some people having amazing results from any of the following. It worked for them. Cool. However, I wouldn't put any time, money, or hope on the options in the picture below. Looking at the broader numbers of people suffering from Tendonitis, MOST people’s experience will be something like "It helped some, then the pain eventually came back." Rest stops irritation of the structure….as long as you continue not to use the structure. Anti-Inflammatory meds and pain killers cut the inflammation process temporarily, but not enough to help you actually heal correctly. Corticosteroid injections cut the inflammation process temporarily, but can come at the cost of increased pain, actual damage, and other potential downsides. Pain Relief Cream is possibly soothing, but can't reverse Tendonitis. Tendonitis Surgery... in a very small percentage of cases is a ‘fix’. The rest...good luck and I hope it works out for you. Tendonitis of all 'types' follows a particular dynamic...Use, Tightness, Damage, Pain....Repeat. If you just deal with the pain, even if you are successful with that, you still have the problem of the Use, the Tightness, the Damage, and the body's response to all that. If you're going to spend time trying to get out of pain, you might as well do it the RIGHT way. You can start getting out of pain now, for free, by visiting the How To Reduce Inflammation page. And do what it suggests that you do! Pills, rest, and splints take little to no time or effort but....they don't work. 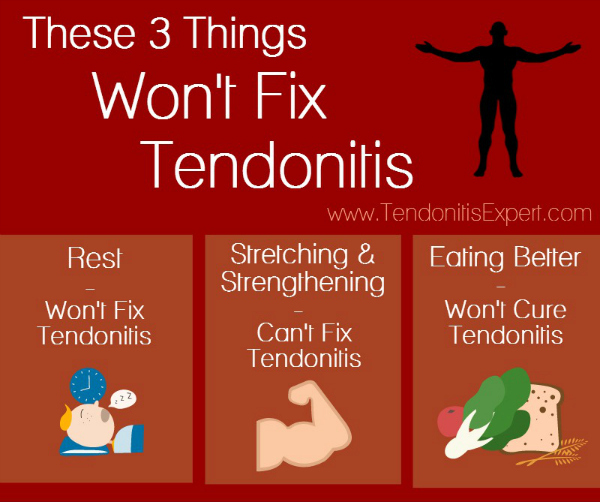 With the RIGHT treatment Tendonitis can be quickly reversed! 'The Tendonitis Treatment That Works' DVDs and Ebook Programs. These DVDs won't win me any Oscars for their film production values, and results wise, I'll put my Tendonitis Treatment DVDs up against anything else that's you'll find on the market. If you follow the recipe I provide, you will get results. If you have Carpal Tunnel Symptoms, then you will want 'The Carpal Tunnel Treatment That Works'. You will get specific self-care tools and education, the concepts and activities that will cause the greatest results for you. 'The Carpal Tunnel Treatment That Works'. If you have Plantar Fasciitis Symptoms, then you will want 'The Plantar Fasciitis Treatment That Works'. 'The Plantar Fasciitis Treatment That Works'. If you have Tennis Elbow Symptoms, then you will want 'The Tennis Elbow Treatment That Works'. 'The Tennis Elbow Treatment That Works'. If you have Achilles Tendonitis symptoms, then you will want the 'Reversing Achilles Tendonitis' ebook program. Whether you're a runner or not, whether you've had achilles surgery or not, the how-to program can get you moving pain free again. If you have Bicep Tendonitis symptoms anywhere from the elbow to the shoulder, then you will want the 'Reversing Bicep Tendonitis' ebook program. Whether you've had bicep tendon surgery or not, the how-to program can get you moving pain free again. Find out more about 'Reversing Bicep Tendonitis'. 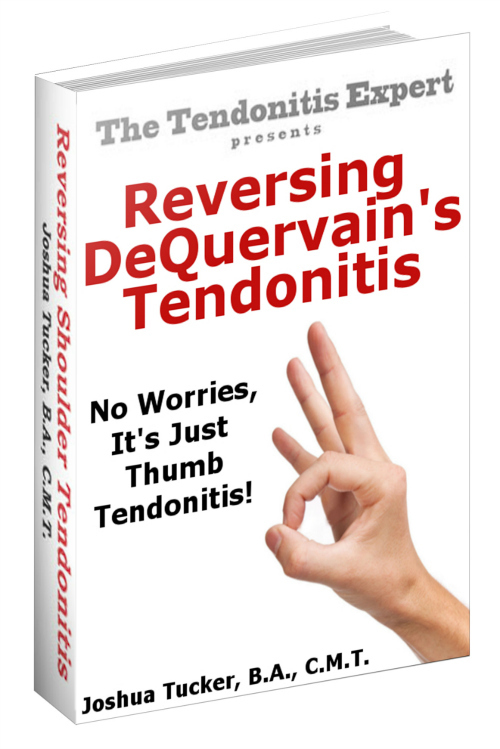 Find out more about 'Reversing DeQuervain's Tendonitis'. If you have guitar Tendonitis symptoms anywhere from the finger to the shoulder, then you will want the 'Reversing Guitar Tendonitis' ebook program. Whether you play guitar or piano or any other instrument, the how-to program can get you moving pain free again. Find out more about 'Reversing Guitar Tendonitis'. Can't run or jog or walk or stand? If you have shin splints symptoms, then you will want 'Reversing Shin Splints' ebook program. Whether you're a runner or not, whether you've had shin splint surgery or not, the how-to program can get you moving pain free again. Find out more about 'Reversing Shin Splints'. If you have Shoulder Tendonitis symptoms, then you will want 'Reversing Shoulder Tendonitis' ebook program. Whether you've had shoulder tendon surgery or not, the how-to program can get you moving pain free again. Find out more about 'Reversing Shoulder Tendonitis'. If you have whiplash symptoms anywhere in the neck and upper shoulder area, then you will want 'Reversing Whiplash' ebook program. Whether you have new pain or old, mild or severe, the how-to program can get you moving pain free again. Find out more about 'Reversing Whiplash'. Return to the top of this Tendonitis Treatment page.